At rock bottom, when you look down, all you can see is darkness. When you look forward, back, all around, it still looks about the same. As you look up, as you move forward, the sun is there to remind you that things will get better. There is a much brighter world ahead than the one you see now. 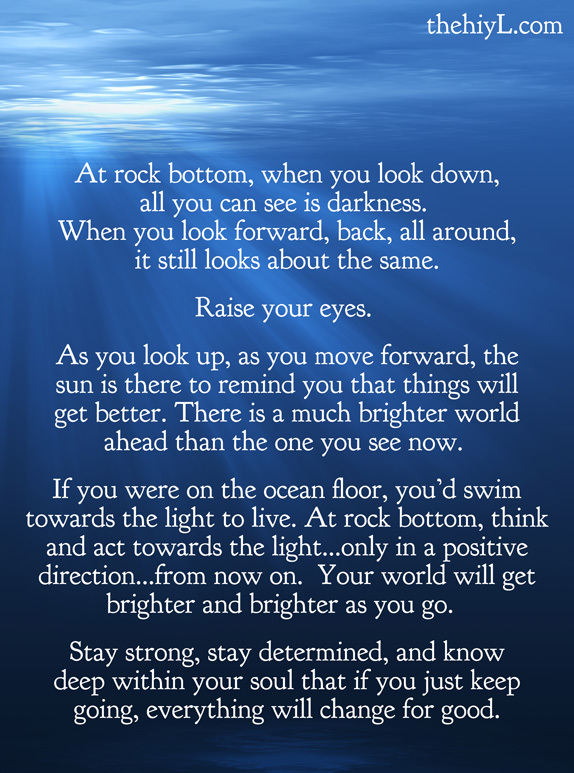 If you were on the ocean floor, you’d swim towards the light to live. At rock bottom, think and act towards the light...only in a positive direction...from now on. Your world will get brighter and brighter as you go. Stay strong, stay determined, and know deep within your soul that if you just keep going, everything will change for good. How did life turn out this way? As a child, dreams of the future never looked like this. No day seems any better than the last. Please stop these thoughts from swirling through your mind. They may be true, but just for this moment. They are not true of life as a whole. When you look down, all you can see is darkness and a dead end. You’ve not even begun to live, but first, raise your eyes. As you believe, so it becomes. This current state is not your fault. You didn’t wish it into existence. But you have thought that the world just happened to you, and lowered and lowered your expectations along the way. So, now it’s rock bottom. Rock bottom is an awful, painful, pain beyond words experience. It’s only something to get through, no one stays here. Years from now, you’ll look back and wonder how you did it. Life will look so much different. There is joy to be found. There are smiles to be seen. There is love to be shared. When you can’t take anymore, it’s not time to give up. It’s time to believe things will get better. Then look for the signs. A sunrise, a bit of luck, a kind stranger. Your beliefs drive your reality, so as tough as it is to change those beliefs when you’re at your lowest and have no energy left to hope, please find it. Please find that light deep within you, even if it’s just a flicker. As you have breath in your lungs, it exists. When you believe, you will see changes. The flicker will spark and grow to a small flame. Over time, and with plenty of faith, it will get easier, and you will be able to appreciate with ease all that is given to you in life. Your light will shine so brightly. Your purpose is to live. This world can be and will be so much different that you’ll hardly remember this day. I wish I could prove this to you. I wish I could take you just for an instant now and show you what it will be like so that you’d know and you wouldn’t even have to question or try to find hope somewhere in the darkness. I can’t do that, but I can promise you with every single ounce of my being that it’s true. Any awful thoughts that come in, just stop them. Don’t think them. Think positive thoughts instead, even if you have to really try and force those positive thoughts through. Re-train your mind with positive thoughts and no matter what negative things any day brings in, keep your thoughts inside directed positively. It’s hard at first, but it gets easier with practice. Soon it will become a habit. Good things are in store. Find something good about every day. Even if it’s just a walk in a park and seeing some beauty in the world in its natural state. You will always find what you are looking for, so from now on, only look for good things. It may take a little while, but you will find them. Appreciate every little good thing that comes along. Appreciation also means to increase. So as you appreciate, you will have more to appreciate. This leads to an amazing upward spiral. But that’s in the near future. For now, just breathe. Breathe deep, close your eyes. Imagine breathing in a bright, white light, and imagine anything negative that’s in you as dark grey smoke that comes out with every exhale and disappears. Breathe slowly, and anytime a new or repeat negative thought comes through, think “release, release, release” and let it flow out with your exhale. You’ve made it this far and you know inside that you want to make it through. You may have doubts that you can, or that you should even want to, but again, please please trust that everything I’ve said is true. I don’t make promises that I can’t keep. I promise you, things will get better. If you're having any thoughts whatsoever of ending your life, please don't go it alone. You can talk anonymously. It's not weak to reach out. It's very strong. You may need someone today, but you may be there for someone in the future. You will know exactly what they are going through. Beautiful message of hope! Nikky, Hang in there until August! You can do it! Become free.